Australian propaganda was designed to maintain public anger about German atrocities and idealise Australian soldiers. Most pieces promoted enlistment in some way or another and the most violent propaganda images surfaced around the time of the conscription debates. Germany’s invasion of Belgium meant that German forces were easily portrayed as the aggressors in the conflict. Allegations of atrocities in Belgium were used to promote an image of the Germans as inhuman and monstrous. One month after the landing at Gallipoli, the English passenger ship RMS Lusitania - a ship almost the size of the Titanic - was sunk by German submarines. 1,198 passengers and crew were killed. 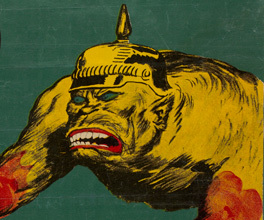 The attack became a recurring motif in Allied propaganda. Norman Lindsay, artist and author of the much-loved children’s book The Magic Pudding, created some of the most striking Australian propaganda. Lindsay’s Germans were monstrous and bloodstained, their victims (usually women and children) symbols of the innocent victims of Europe. Deliberately or otherwise, in the age of mass literacy, the lies, exaggerations and errors of the battlefield were turned into official communiqués and elaborated upon in correspondents’ dispatches. A leader writer might then compound everything that went before and distort the product further with fantasies of his own. Lies, exaggerations and errors, mixed with elements of the truth, represent the stuff of legend…there is enough in the Australian military achievement in the Great War, notably from 1918, to render exaggeration superfluous. The Gallipoli conflict is a good example of how propaganda aims were fulfilled for different nations. In Australia, newspapers celebrated the heroism of the men in the landing rather than dwelling on the 10,000 casualties in the first few months. The heroism of individuals like Victoria Cross winner Albert Jacka was used to put forward an image of service as glamorous and heroic. Recruitment propaganda also used appeals to Australian men's love of sport, and the sporting values of courage and team spirit. British newspaper The Spectator would call the evacuation from Gallipoli ‘a military miracle’, a phrase that would be eagerly repeated by The Argus in December 1915. But for the Turkish people, Gallipoli represented a heroic defence against invaders. In German newspapers, driving the Allied forces back from the peninsula was seen as a great victory. The Germans, too, minimised the heavy losses of the Turkish forces. The two sides of propaganda were clear in the debates about conscription. Much of the propaganda depicted women or was directly aimed at women (soldiers' mothers, sisters, wives and girlfriends). But anti-conscriptionists also appealed to women, calling a vote for conscription a 'blood vote' and reminding women that they were possibly sending young men to their deaths. On both sides of the conflict, the battle for the support of civilians was crucial. The public had to provide the men to fight and the money and labour to support the war effort. This often meant that journalistic standards of truth and objectivity were put aside. As World War I dragged on and the casualty list grew, Australia struggled to maintain troop numbers. The Western Front settled into a line 20km wide and 800km long, running from the English Channel to the Swiss Alps.